Animals exhibit different types of body symmetry. The sponge is asymmetrical, the sea anemone has radial symmetry, and the goat has bilateral symmetry. Animal body plans follow set patterns related to symmetry. They are asymmetrical, radial, or bilateral in form as illustrated in [link]. Asymmetrical animals are animals with no pattern or symmetry; an example of an asymmetrical animal is a sponge. Radial symmetry, as illustrated in [link], describes when an animal has an up-and-down orientation: any plane cut along its longitudinal axis through the organism produces equal halves, but not a definite right or left side. This plan is found mostly in aquatic animals, especially organisms that attach themselves to a base, like a rock or a boat, and extract their food from the surrounding water as it flows around the organism. Bilateral symmetry is illustrated in the same figure by a goat. The goat also has an upper and lower component to it, but a plane cut from front to back separates the animal into definite right and left sides. Additional terms used when describing positions in the body are anterior (front), posterior (rear), dorsal (toward the back), and ventral (toward the stomach). Bilateral symmetry is found in both land-based and aquatic animals; it enables a high level of mobility. Animals with bilateral symmetry that live in water tend to have a fusiform shape: this is a tubular shaped body that is tapered at both ends. This shape decreases the drag on the body as it moves through water and allows the animal to swim at high speeds. [link] lists the maximum speed of various animals. Certain types of sharks can swim at fifty kilometers an hour and some dolphins at 32 to 40 kilometers per hour. Land animals frequently travel faster, although the tortoise and snail are significantly slower than cheetahs. Another difference in the adaptations of aquatic and land-dwelling organisms is that aquatic organisms are constrained in shape by the forces of drag in the water since water has higher viscosity than air. On the other hand, land-dwelling organisms are constrained mainly by gravity, and drag is relatively unimportant. For example, most adaptations in birds are for gravity not for drag. Most animals have an exoskeleton, including insects, spiders, scorpions, horseshoe crabs, centipedes, and crustaceans. Scientists estimate that, of insects alone, there are over 30 million species on our planet. The exoskeleton is a hard covering or shell that provides benefits to the animal, such as protection against damage from predators and from water loss (for land animals); it also provides for the attachments of muscles. As the tough and resistant outer cover of an arthropod, the exoskeleton may be constructed of a tough polymer such as chitin and is often biomineralized with materials such as calcium carbonate. This is fused to the animal’s epidermis. Ingrowths of the exoskeleton, called apodemes, function as attachment sites for muscles, similar to tendons in more advanced animals ([link]). In order to grow, the animal must first synthesize a new exoskeleton underneath the old one and then shed or molt the original covering. This limits the animal’s ability to grow continually, and may limit the individual’s ability to mature if molting does not occur at the proper time. The thickness of the exoskeleton must be increased significantly to accommodate any increase in weight. It is estimated that a doubling of body size increases body weight by a factor of eight. The increasing thickness of the chitin necessary to support this weight limits most animals with an exoskeleton to a relatively small size. The same principles apply to endoskeletons, but they are more efficient because muscles are attached on the outside, making it easier to compensate for increased mass. Apodemes are ingrowths on arthropod exoskeletons to which muscles attach. The apodemes on this crab leg are located above and below the fulcrum of the claw. Contraction of muscles attached to the apodemes pulls the claw closed. An animal with an endoskeleton has its size determined by the amount of skeletal system it needs in order to support the other tissues and the amount of muscle it needs for movement. As the body size increases, both bone and muscle mass increase. The speed achievable by the animal is a balance between its overall size and the bone and muscle that provide support and movement. Smaller endothermic animals have a greater surface area for their mass than larger ones ([link]). Therefore, smaller animals lose heat at a faster rate than larger animals and require more energy to maintain a constant internal temperature. This results in a smaller endothermic animal having a higher BMR, per body weight, than a larger endothermic animal. A standing vertebrate animal can be divided by several planes. A sagittal plane divides the body into right and left portions. A midsagittal plane divides the body exactly in the middle, making two equal right and left halves. A frontal plane (also called a coronal plane) separates the front from the back. A transverse plane (or, horizontal plane) divides the animal into upper and lower portions. This is sometimes called a cross section, and, if the transverse cut is at an angle, it is called an oblique plane. [link] illustrates these planes on a goat (a four-legged animal) and a human being. 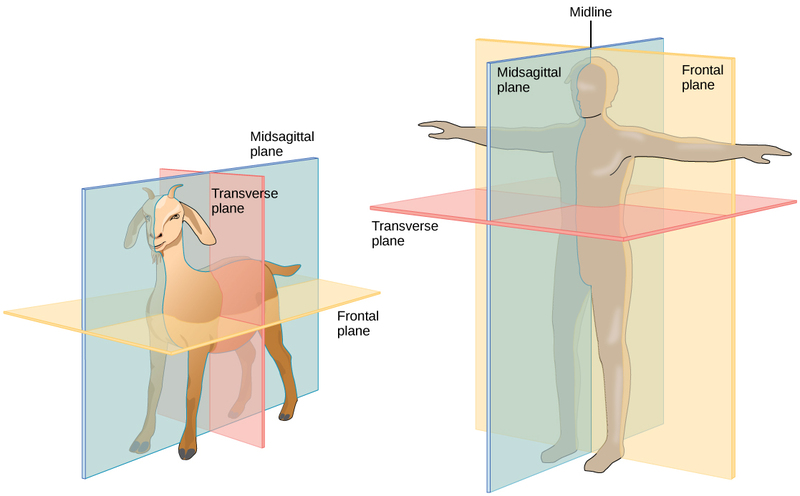 Shown are the planes of a quadruped goat and a bipedal human. The midsagittal plane divides the body exactly in half, into right and left portions. The frontal plane divides the front and back, and the transverse plane divides the body into upper and lower portions. Vertebrate animals have a number of defined body cavities, as illustrated in [link]. Two of these are major cavities that contain smaller cavities within them. The dorsal cavity contains the cranial and the vertebral (or spinal) cavities. The ventral cavity contains the thoracic cavity, which in turn contains the pleural cavity around the lungs and the pericardial cavity, which surrounds the heart. The ventral cavity also contains the abdominopelvic cavity, which can be separated into the abdominal and the pelvic cavities. Physical AnthropologistPhysical anthropologists study the adaption, variability, and evolution of human beings, plus their living and fossil relatives. They can work in a variety of settings, although most will have an academic appointment at a university, usually in an anthropology department or a biology, genetics, or zoology department. Animal bodies come in a variety of sizes and shapes. Limits on animal size and shape include impacts to their movement. Diffusion affects their size and development. Bioenergetics describes how animals use and obtain energy in relation to their body size, activity level, and environment. 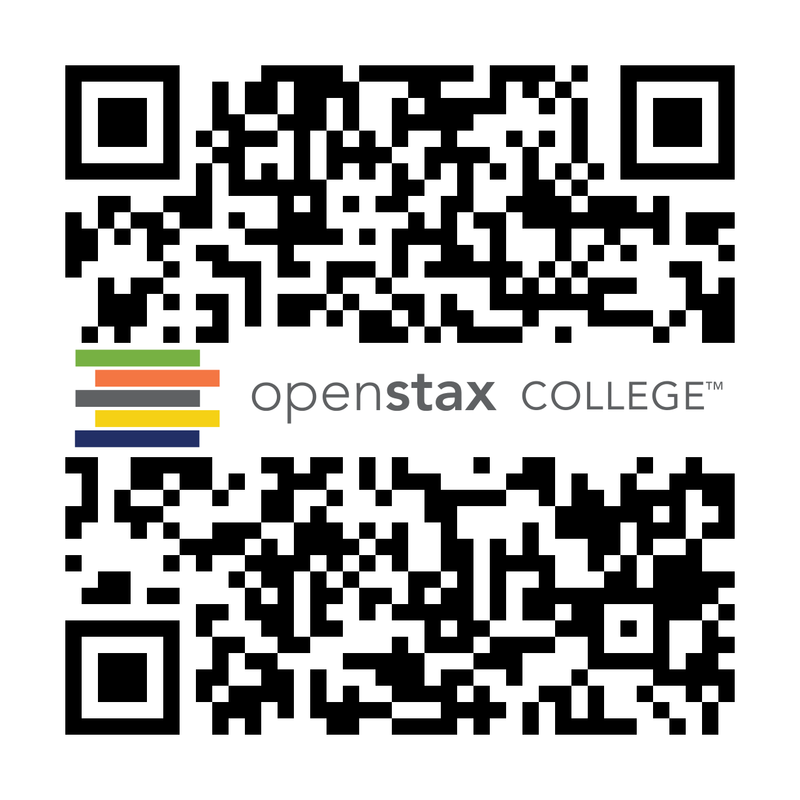 Animal Form and Function by OpenStaxCollege is licensed under a Creative Commons Attribution 4.0 International License, except where otherwise noted.